You know how people say that “some things just can’t be replaced”? Well, they can – for something equal or better. This was the thought crossing my mind when I entered Tease. 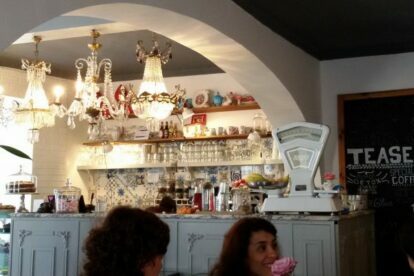 This very same cafe once provided Lisbon’s most sugary and delicious cupcakes in a different neighbourhood – and I was sad to find out that they had closed the one place where I knew my sugar level could climb to newfound heights. Fortunately, Tease came back and found a new home very close to one of the city’s most special squares – the Praça das Flores area, brimming with new cafes and restaurants. This cafe is a small but cozy place with a lot of charm: a bit antique and a bit hipster, with some lights snacks. It’s perfect for an afternoon with tea, some very, very sugary chocolate cupcakes (my favorite!) and good company. It’s good to know that despite the changes, some things remain the same :).